The concluding chapter reflects on the findings presented throughout the book. Mobilities as social constructs are experienced and imagined very differently, not least according to age, gender and family context. Most significant of all is the issue of gender equality, which permeates the material reality of so many mobilities stories. 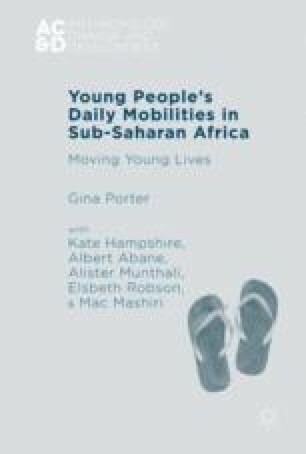 Attention is given to some of the practical mobility-related interventions which have potential to improve the course of young people’s lives in sub-Saharan Africa: these are not necessarily about improving mobility per se, of course, since in some contexts less, rather than more mobility could be beneficial. The final section of the chapter reflects on the influence of wider in-country policy decisions and practice and the international sphere, not least the issue of mobility targets in the MDGs and SDGs.